By now, Moon Design has a tradition of producing expensive, but hefty, sourcebooks for Glorantha. The latest offering, Pavis: Gateway to Adventure is no exception. At $60, it's two to three times the price of urban sourcebooks such as the Zobeck Gazetteer or Pirate's Guide to Freeport. But there's clearly a reason for that: those books are 116 and 256 pages, respectively, whereas this one is over 416. And, for that matter, the price compares well with the monumental Ptolus: City by the Spire, which weighs in at 808 pages and $150. (I'm ignoring PDF versions here). Pavis is billed as the third part of the Sartar line, with the other two parts being Kingdom of Heroes and the Sartar Companion. Like those two books, it is divided between source material and adventures, with about two thirds of the book being taken up by the former. 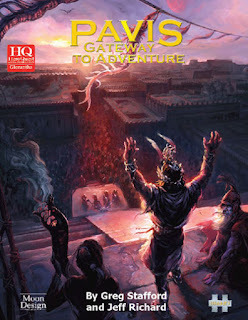 As the third in a line, it isn't intended to be stand-alone, and the nature of Glorantha would probably make it harder to port into other settings than, say, Freeport would be. As such, it's probably fair to say that this is aimed at existing fans, rather than the casual RPG purchaser. Indeed, that's probably more true with this volume than the previous two, since, it is, of course, an update of the RQ2 supplements Pavis: Threshold to Danger and Big Rubble: the Deadly City from the early 1980s, and has obvious old-timer appeal. The new version is written for HeroQuest 2, although, frankly, that's such a rules-lite system (and most of the setting-specific rules are in Kingdom of Heroes, anyway) that, assuming you're willing to put the work in, the book is almost equally useful to someone playing some version of RuneQuest. Or whatever else your system of choice might be, come to that. (Well, okay, so something like Pathfinder might be a lot of work, but you get the idea). On the other hand, much of the text (and art) is preserved from the original, albeit in expanded and updated form, so if you really do want the book only for RQ2, and you already have the originals, this isn't essential. Useful, perhaps, because there is new material, and probably nice to have - but not essential. The book starts with an expansion to the character generation system in Kingdom of Heroes. This reflects the more cosmopolitan nature of the city compared with the farms of Sartar. New cultural backgrounds available include native Pavisites, Sun Domers, Lunar settlers, and River Folk. Inevitably these are less detailed than the Orlanthi are in KoH - which arguably leads to more potential for creativity and development by the GM and/or players. Bandits, fishermen, and stonemasons are new options for character types, and, this being HeroQuest, it's not exactly hard to come up with further options if you might need them. If you're a local Orlanthi, there's also an expansion to the clan generation system from KoH, explaining why your clan lives near Pavis, instead of in Sartar. Accompanying this, the book also includes six cults new to HeroQuest 2. The city god of Pavis is obviously included, as are the local deities Flintnail and Zola Fel, and the thief-god Lanbril - more appropriate in this urban setting than he would have been in the Sartar books. Perhaps more significantly, in the grand scheme of things, we have the long-awaited HQ2 write-ups of Yelmalio and the Seven Mothers. The latter has a particularly detailed 19-page write-up, as befits the complexity of the cult. There then follows a good overview of the lands around Pavis, including Pavis and Sun Dome Counties, Corflu, the wastes of Prax, and the Lunar Grantlands. There are a number of maps here, three of them in full colour, providing a real detail to the surrounding area that is often missing in FRPG city sourcebooks. There are 37 encounters included for travelling through Prax and the River of Cradles, in the same style as in Sartar Companion. I will note at this point some mistakes with the art direction - the pictures of the Impala and Sable Riders on pages 114 and 132 have been accidentally swapped around, and why there are pictures of a blackbuck and a kob on p. 141, I have no idea. The next section is, in a way, the core of the book: the description of Pavis city itself. This, as one might hope given the page count, really manages to cover all the bases. There are details on politics, crime, temples (of course), shops, and so on. There are building plans for some key locations, and loads of characters. This very much brings the setting to life, portraying a city that isn't your standard fantasy fare. Being Gloranthan, Pavis naturally has a stronger role for cults and religion than in most other fantasy cities, and has a distinct bronze/iron age feel that's far from the traditional medieval or renaissance setting of, say, D&D. All of this comes across strongly, and things like cut-away drawings of typical homes help to give it atmosphere. Another difference is that the majority of cities with dedicated sourcebooks in FRPGs are "free cities" of one kind or another, not part of a larger polity. Pavis, by contrast, while historically as free and independent as, say, Freeport, is currently under military occupation by a foreign power, and this alone is a twist on the usual. On the downside, there is some duplication here (and, indeed, elsewhere in the book) with a few sections being repeated verbatim on different pages. Compare, for example, the description of the Eparikondos Speech School on p.211 with that on p.220. But this is a minor oddity, and there's sufficiently little of it that it would make little difference to the final page count. What comes across rather more strongly, at least to me, is a clash between the setting and the system. I don't mean by this that one couldn't run a perfectly good HeroQuest campaign using the material in this book, since clearly one could. But the shadows of the RuneQuest edition of the book are rather visible, with a number of things that really feel like they belong to that sort of system rather than the more free-wheeling narrativist style of HeroQuest. This isn't, let's be clear, a bad thing. Perhaps the most obvious example, for instance, is that the book includes a price list, something that makes little sense in HeroQuest. But it's not meant to; it's included to help those who want a game in a more traditional style, and probably one using a different system. That the authors chose to include this, when they didn't have to, is definitely a point in their favour. Kudos to them for doing so. At the same time, though, I, at least, couldn't help thinking while reading it: "this would make a good HeroQuest setting... but it'd make an even better one for something like Savage Worlds or Cortex." The description of the city concludes with 30 regular encounters, and 20, briefly described, "special" encounters for use in the city. As with those in the Praxian section, the regular ones range from half a page to page, and include some specific NPCs to illustrate the general nature of the encounter. The special encounters refer to broader, city-wide events that occur from time to time, giving more flavour of life in the city - Lunar crackdowns, religious festivals, and so forth. Compared with the city proper, the description of the Big Rubble is much shorter, with only 6 pages, compared with 89. To be fair, much of it is literally rubble, which there isn't a lot to say about, and isn't worth detailed mapping. But I would have liked to see more on the regular settlements that dot it. The Real City, for example, receives only three sentences, but evidently has a number of interesting inhabitants, and, presumably, some interesting locations within it - it's apparently a small town in it's own right. Why include less about this than, say, Corflu, which is about 200 miles away from Pavis, yet still receives a full four pages? And so, on to the scenarios. Aside from some brief scenes and plot hooks for new arrivals, there are four of these in the book. The first, "Rough Business", is simply an introduction to the setting and its politics, with little in it beyond that. It performs its function admirably enough, but it can't really be described as stand-out. The other three are likely to be more memorable, although, for my money, "Red Moon Rising" is rather confusing. The Raymond Chandler-style "The Purple Troll", and the more traditional "The Celestial Engine" are, however, particularly good, and it's hard to find any fault with them. A point worth noting though, is that two of the scenarios do assume that the PCs are on the side of the Sartarite rebellion, or at least of Orlanthi in general. Given that this book is intended as one of a set with Kingdom of Heroes and the Sartar Companion, that's a perfectly reasonable assumption, since it is the overall theme of the series. However, because this volume explicitly permits (without actually encouraging) PCs to be Seven Mothers-worshipping Lunar settlers, it is at least something to bear in mind. Really, though, this is just another example of the book being open to as many different styles of game and campaign as it can be - which is something to be encouraged. Having said that, the feel of these scenarios is very different from those in the previous two volumes. Partly, that's the urban setting, but they do also feel "lower level" than the earlier ones. In KoH, after all, the heroes literally went to Hell and back, fending off an army of demons. Now the odd thug on the streets of Pavis is meant to be a serious concern. Of course, the system handles this seamlessly, since numbers never really mean anything in HQ2. So if you're cool with that, there's no issue with using them together. But, at least for me, this would be somewhat jarring, and it will probably feel rather odd if you're trying to adapt the setting to more simulationist systems. The solution is simple enough: run this with fresh characters, rather than as a sequel to activity in Sartar. Given the different nature of the environment, and the grittier flavour that the setting evokes, that's probably a good plan anyway. So there you have it. Pavis: Gateway to Adventure is, it seems to me, an attempt to do something rather different with Gloranthan HeroQuest than the two Sartar books. It's grittier, and less openly heroic; something closer to traditional fantasy adventuring than the previous volumes. And, with no more than a few minor quibbles, it does it very well. But is it worth $60 - quite a lot for a gaming book? Well, let's see: it's over 400 pages, very few of them splash art, with a number of full-colour illustrations and little wasted space. It's flexible, almost system-neutral, and distinctly atmospheric. So, on the whole, while there might be some points to bear in mind, I'd have to say "yes". Great review, and very objective considering it is written by a long time fan. Out of curiosity, why did you pick Savage Worlds and Cortex as possibly being better fits for the setting? Is there something in particular about those systems that you think makes them a particularly good fit? They are flexible systems that seem to have the right balance of rules simplicity and structure. But, most importantly, I have some familiarity with them, so they came to mind first. I'm sure there are others that would do equally well.